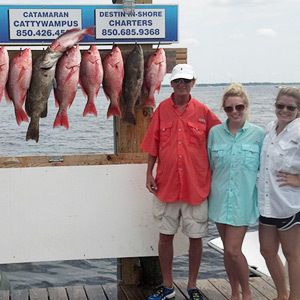 Our guided inshore bay fishing trips take place in the Choctawhatchee Bay. You will fish around structures such as docks, bridges, jetties and oyster beds. In the warmer months you may also drift along grass flats with popping corks and live shrimp for some top water action. Our most popular trips are our 4 or 6-hour half-day trips. Live bait is most commonly used but artificials may be brought in in certain situations. We use all light tackle spinning reels and lightweight rods. Our equipment is top of the line and easy for everyone to use even the beginner angler. 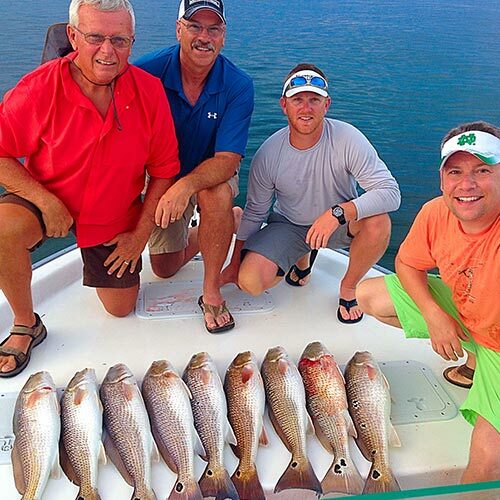 Not too far but not inshore fishing, our Near-shore Gulf fishing trips are a great way to experience bottom fishing and trolling without having to go out a long way from shore. These trips are not quite considered “deep-sea fishing” but they allow for you to catch species such as Red Snapper, King Mackerels, Spanish Mackerels, Black Snappers, White Snappers, Triggerfish, Vermillion Snappers, and the occasional Amberjack. On this trip, you will be fishing two to seven miles off the beach and you will be in-sight of land the entire time. These trips are weather dependent and take place on our 40ft boat called the Backlash! **We require a 6 hour minimum for gulf fishing. KIDS FISHING AT ITS FINEST! 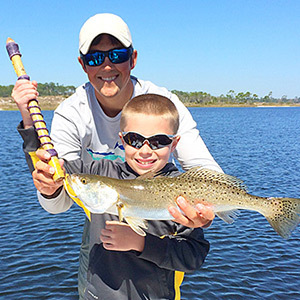 With kids being the future of our sport, we take pride in our Kid’s fishing trips. We offer a 3 Hour kid-fishing trip designed for ages 12 and under. The first hour and a half will be fish time! We will target anything and everything that is biting to ensure constant action. We will teach the kids hands on technics on how to use the rods and reels. The last hour and a half we will wrap up the trip with a boat ride and private dolphin cruise. The dolphins here quite often put on a great show and allow boaters to get up close and personal with them. Be sure to bring your camera! ALL LICENSES, TACKLE, BAIT, ICE AND FISH CLEANING are included on every trip. The only exclusions are food/drink and gratuity for the captain.